The initial reaction to the announcement of the iPhone 4S was muted. First there’s that name: It’s the old phone’s name with an S attached to it. As the iPhone 3GS taught us, adding an S to an iPhone’s name can represent numerous under-the-hood improvements, but it doesn’t send shivers down your spine like incrementing a number by one and unveiling a redesigned exterior with mind-blowing features that may or may not include anti-gravity. Apple’s never going to win a competition with the wildest imaginations of tech bloggers. But the company seems to be doing OK in the business of building phones. The iPhone 4, which remained more or less unchanged for 15 months as approximately a zillion Android smartphone models came and went, has consistently been the best-selling smartphone around. 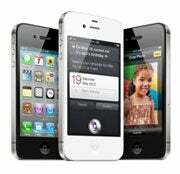 Now here comes the iPhone 4S, which is more of a good thing: It takes the successful look of the iPhone 4 and tosses in a dual-core processor for dramatically improved speed, an upgraded camera, and some brand-new voice-command technologies. It’s a classic look, easily my favorite of all the iPhone designs to date. The fit and finish are immaculate; not a single thing about the iPhone 4S feels cheap. In terms of styling, the iPhone 4 feels like the most expensive electric razor ever made, or maybe like a finely-tuned luxury watch. The same eye-popping 960-by-640-pixel screen introduced with the iPhone 4 is present on the iPhone 4S, too. Dubbed the “Retina display” by Apple, it’s got a screen resolution of 326 pixels per inch, meaning that the average human eye can’t even see individual pixels. The result is marvelous. Reading text is like looking at a printed page. High-definition videos and photos display tiny details. With the exception of a micro-SIM card slot on the right side, the iPhone 4S is a dead ringer for the Verizon/CDMA version of the iPhone 4 introduced in February. Extremely precise cases designed specifically for the original iPhone 4 may have trouble fitting over the ring/silent switch and the volume buttons of the iPhone 4S, which are slightly shifted from their position on the GSM iPhone 4; precision cases for the Verizon iPhone 4 and less-precise iPhone 4 cases will have no trouble. On the front of the phone there’s a VGA-quality camera (640-by-480 pixels) that’s designed to be used for video chatting, either via Apple’s FaceTime technology or via a third-party app such as Skype or Google+. This, too, is unchanged from the specs of the iPhone 4. The iPhone 4S atop an AT&T/GSM iPhone 4. This does not mean that the iPhone 4S is essentially the iPhone 4 with the benefit of an extra letter. 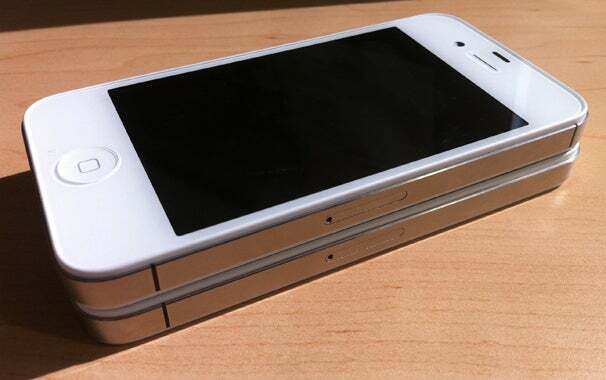 Because on the inside, the iPhone 4S is dramatically different from the iPhone 4. Like the iPad 2 before it, the iPhone 4S is powered by an Apple-designed A5 processor. This is a dual-core processor that’s one generation more advanced than the A4 processor that powered the iPhone 4 and the original iPad. Two processor cores don’t necessarily mean the iPhone 4S is twice as fast as the iPhone 4—that has a lot to do with how efficiently a device’s software can take advantage of spreading the workload across both cores. But the 4S’s upgraded processor definitely provides a large speed boost, akin to the upgrade from the original iPad to the iPad 2. The results of my general-performance tests showed the iPhone 4S to be between roughly twice as fast as the iPhone 4. Apple claims graphics performance on the iPhone 4S has been boosted even more by the graphics component of the A5, with speed gains of as much as 7x. That’s a best-case scenario, but my tests with the GLBench Pro graphics benchmarking app did show enhanced graphics performance. One 3D test sequence played at roughly five times the frame rate of the same scene on the iPhone 4; another was roughly double the frame rate. Of course, many people won’t be upgrading to the iPhone 4S from the iPhone 4, due to those pesky two-year phone contracts that cell carriers insist on. But a whole lot of people will be upgrading from two-year-old iPhone 3GSes. 3GS users will see an even larger speed increase, of course. The 4S had more than double the score on the GeekBench testing app, and loaded a test webpage in a third of the time. The only iOS device in existence that can match up—and even beat—the iPhone 4S is the iPad 2. In most of my tests, the iPad 2 was slightly faster than the iPhone 4S. (The original iPad was similarly faster than the iPhone 4, in fact.) Of course, the iPad 2 doesn’t fit in your pocket, unless you have unusually large pockets or are a clown, or both. Apple claims that talk time on the iPhone 4S’s battery is actually an hour longer than on the iPhone 4, but that Wi-Fi surfing will drain the battery an hour sooner. Apple says that the innards of the iPhone 4S have been entirely redesigned—so many components have changed, there’s no simple explanation for the change in the company’s battery-life claims. It seems clear, though, that some components are more energy efficient than on the iPhone 4 (I’m looking at you, cellular radio) while others eat more power (dual-core A5 processor). The end result is a phone that offers largely the same battery life as the iPhone 4. However, I didn’t get a chance to run any dedicated battery tests on the iPhone 4S. In general usage, it didn’t seem to run out of battery any faster than my trusty iPhone 4.